This is Elizabeth Murmu,57, resident of Tarani,Dumka, Jharkhand. She was suffering from pain in her lower abdomen region for 2-3 years. She checked with several doctors but her health did not improve. 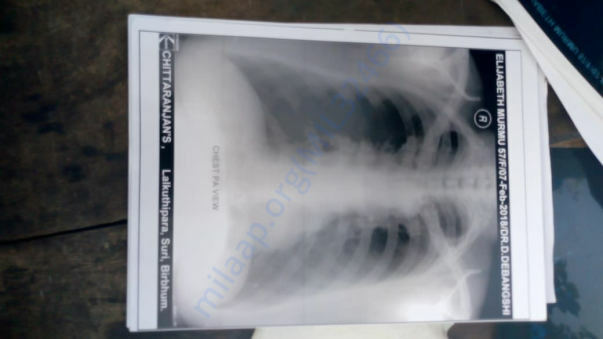 Recently she was taken to Durgapur IQ City Narayana Multispeciality Hospital and there the doctors after checking all her reports confirmed she has got Cancer.Miss Elizabeth is financially very weak and has nobody to help. Some kindhearted people helped her with all the tests and for consulting the doctor. The doctor has referred her to Kolkata for further treatment. Request everyone to come forward and help Elizabeth in any means possible. 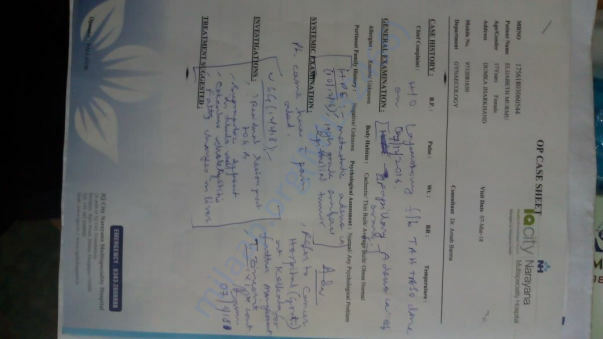 Elizabeth Murmu does not have a bank account so the money raised will be transferred to her brother's bank account so that she can purchase the medicines required.We have not yet got an estimate about the expenses as her treatment is yet to begin from the 14th March 2018. Thank you! Elizabeth Ma'am has undergone two more dosage of Chemotherapy on the 11th and 12th June. Her blood test date is due on 25th June which will decide the further course of treatment. She is doing better now and has thanked all of you for coming forward. Thank you! Please keep her in your prayers as she is still not completely fit. Elizabeth Ma'am has undergone six doses of chemotherapy till now. Doctors have suggested that she will undergo two more sessions of chemotherapy. Thank you so much for the support and love which you have shown towards us, we shall keep you all posted. Thank you for the wonderful support. 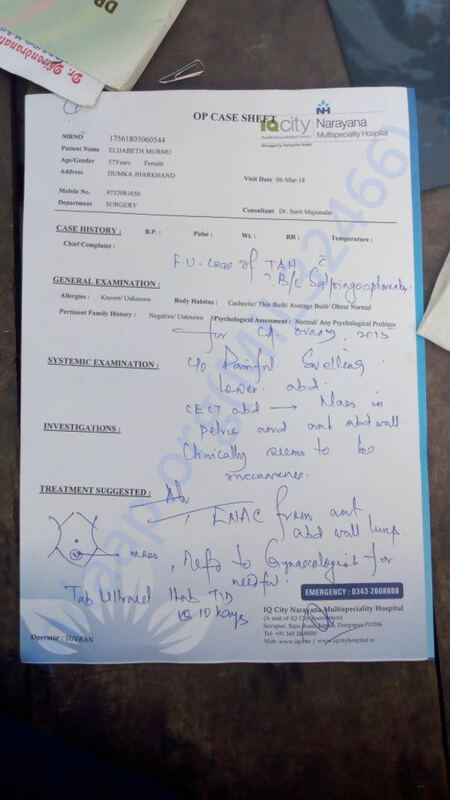 The next set of chemotherapy is scheduled on the 9th April. 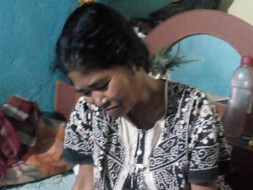 Elizabeth Mam is running short of Rs 10,000/- so she is unable to go through the process. Request to please help! Please help and share!